In a nutshell, it was depressing, and it made me wonder if I wasn’t some sort of mutant from the imagination of a mad scientist, that resisted all cosmetics… So, obviously, without convincing results, I stopped using those useless cosmetics, and started using a simple basic cream. And things went back to normal; some “symptoms” (pimples, irritation…) got better… in the course of some days. At the time, I proudly declared to myself: it’s normal, it’s part of growing up, I’m sure of it, I’m growing up!!! I’m turning into a man! Alleleuia! No more pimples for me! But since I didn’t know about any of that at the time, I couldn’t figure it out… (Sometimes I dream of going back in time to change the course of events… that could have saved me some bad surprises. Doesn’t that ever happen to you?) We surely can’t go back in time yet (not officially anyway… thank you television series) but I can help you better understand the information and the symbols on the packaging and the container of your cosmetic products, so you can choose them more wisely and most importantly, benefit from them more. Maybe my irritations and my pimples can still have been good for something. Before I continue, I suggest you go get one of your cosmetic products and examine it as we go. Operation: Practical course… That should be okay as long as I don’t ask you to dissect a frog… Are you ready? All right, here we go! 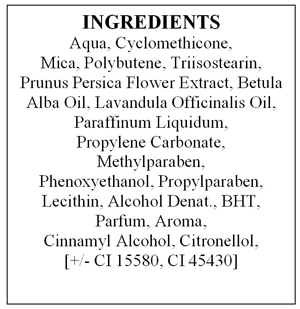 Despite the rather shallow aspects you might think of, you should know that in cosmetics, people aren’t messing around. There’s a number of rules that have to be followed regarding the information on the box. 1) The name (or company name) and address of the manufacturer (or the one responsible for bringing it onto the market). 2) The place of manufacture: this is the well-known “made in …” thing. This is the country where the product was manufactured; note that for cosmetics made outside the EU, this indication is compulsory. And certainly, even though it’s not required, the phrase made in France is still an undeniable marketing trump card… and that’s not even being chauvinistic! 3) The quantity of the product, in weight or volume, except for product under 5 grams (or 5 millilitres), free samples and single dose products. Since cosmetic products are often exported to other countries, foreign regulations require quantity to be indicated in a different measuring system than the metric system, namely the imperial system: Oz net wt: Ounce net weight FL. Oz: Ounce Fluid E.g. : Weight: 1.7 Oz net Wt/ 50g – Volume: 1 FL. Oz /30mL Don’t panic, it’s just a different system! And no, it’s not a rip-off. That reminds me of a pharmacy customer that I sold a cream to once upon a time, who returned the next day, infuriated, telling me 50 Euros for 1.7 millilitres was criminally overpriced… I honestly expected she was going to make me eat that jar! I managed to calm her down and had a look at the jar in question, after quickly checking the emergency exits just in case… I finally understood what had made her so angry: the volume wasn’t indicated in ml., but in FL.OZ., it was an American brand that hadn’t added the volume in ml… I was so relieved! Oh, those volume metric systems, putting my life on the line for a cream. good to know these infos … will help a loot creating a good labels for the brands..